was riddled with bugs and multiple other problems, including downloadable content that allowed players access to more levels of the game, a myriad of connectivity issues, server limitations, lost data and repeated sudden crashes, among other things; (b) as a result, Electronic Arts would not achieve a successful holiday season 2013 rollout of Battlefield 4; (c) the performance of the Electronic Arts unit publishing Battlefield 4 was so deficient that all other projects that unit was involved in had to be put on hold to permit it to focus its efforts on fixing Battlefield 4; and "(d) as a result, Electronic Arts was not on track to achieve the financial results it had told the market it was on track to achieve during the Class Period. 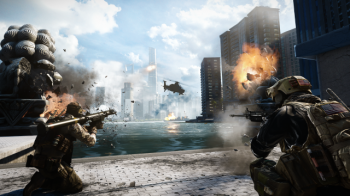 Law firm Robbins Geller has hit EA with a lawsuit over Battlefield 4 on the behalf of affected shareholders. Electronic Arts hasn't had the easiest of launches when it comes to DICE's first-person shooter, Battlefield 4 - and now, it seems things have taken a turn for the worse. U.S. law firm Robbins Geller Rudman & Dowd LLP has filed a class action lawsuit against the publisher on behalf of stockholders affected by the title's commercial performance. According to the filing, the law firm cites that EA has violated the Securities Exchange Act and adds the publisher has allegedly provided "materially false and misleading" statements when it comes to BF4. Not only that, but it also states, "because they (EA) failed to disclose and misrepresented the following adverse facts which were known to or recklessly disregarded by defendants:"
"(d) as a result, Electronic Arts was not on track to achieve the financial results it had told the market it was on track to achieve during the Class Period. The class period ranges from July 24, 2013 up to December 4, 2013, with EA's stock dropping to more than 28% during the time period. In the same report by the Business Wire, it mentions that the Battlefield franchise has provided approximately 11% of EA's revenues for fiscal year 2012. While this fiscal year's report hasn't been revealed yet, it's unclear how much the publisher's revenue will be affected since it has announced that DICE won't be developing further expansions until the game is fixed. With DICE regularly rolling out patches on all platforms for BF4, let's hope this gets sorted out soon for everyone's sake.